Hamilton's Catechism on the Art of Writing for an Orchestra And On Playing From a Score. 12mo., orig. cloth with a printed paper label on the upper cover, viii, 64, 40, 28pp.ads. (With 64pp.text, and 40pp.music)	A trace of wear to the top of the spine o/w a fine copy. Les Maitres Dans Les Arts Du Dessin Par Lelius. Edition Illustree de Vignt-Cinq Portraits Graves Sur Acier A'Apres les Tableaux Originaux du Louvre et des Galeries de Florence. Frontispiece d'apres Paul Veronese. Paris: Amable Rigaud, Editeru, ......	1868. Folio, orig. leather spine, raised bands, gilt compartments, cloth boards with gilt decoration, A.E.G., (154)pp. Occasional foxing not affecting plates o/w a near fine copy with attractive engravings. Paints Varnishes and Brushes Their History Manufacture and Use. Painters, Paperhangers and Glaziers Supplies. Pittsburgh: Pittsburgh Plate Glass,	1923. First edition. 4to., orig. blue cloth decorated in orange, (8), 196pp. Pencil notes for paint recipes on the front pastedown o/w a near fine copy. Pictures in the Collection of J. Pierpont Morgan At Prince's gate & Dover House, London. With an Introduction by T. Humphrey Ward and Biographical and Descriptive Notes by W. Roberts. Tall 8vo., cont. dark green half morocco, cloth, raised bands, gilt, T.E.G. by Zaehnsdorf, no pagination. A fine copy. The English Chair. Its History and Evolution. London: M. Harris & Sons,	1937. First edition. Verve The French Review of Art. Nos. 5-6 July-October 1939. Paris: Editions de la Revue Verve,	1939. Folio, orig. stiff wrappers. Bookplate o/w a fine copy in the original slicpase which is a bit worn at corners but o/w near fine. Illustration by Braque, Bonnard, Matisse and Klee. Verve The French Review of Art. Nr. 7 Vol.2. April-July 1940. (cover title: Les Tres Riches Heures Du Duc De Berry). Folio, orig. stiff wrappers, (34)pp. Bookplate o/w a fine copy in the stiff paper d/w which is fine; in the original box which is about fine. New York: A.Q.Moore,	nd. (circa 1860). Later edition. First published in 1852 . 8vo., orig. brown cloth, 378, pp.ads. Name on the titlepage, occasional foxing, a bit of wear to the foot of the spine but in fact a near fine copy. Sketches of the Lives of Corregio and Parmegiano. London: Printed for Longman,Hurst, Rees, Orme, Brown and Green,	1823. First edition. 8vo., full cont. calf, raised bands, gilt, x, 276, (10)pp.ads. Stamp on foredge, bookplate removed from e/paper, some rubbing a very good copy. Le Rivoluzioni del Teatro Musicale Italiano Dalla sua Origine Fino al Presente. Opera di......Socio dell' Accademia delle Scienze, Arti e Belle Lettere di Padova. Venezia: Nella stamperia di Carlo Palese,	1785. In three volumes. 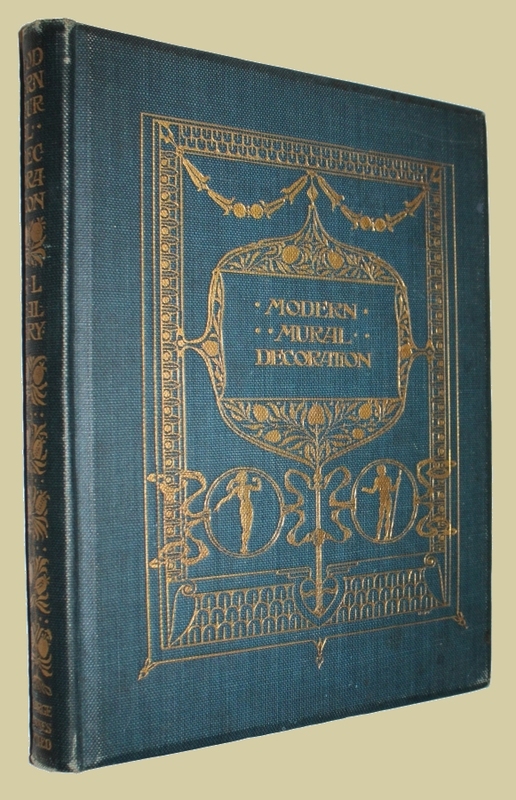 Second edition, enlarged and corrected by the author. Tall 8vo., cont. vellum spines, marble boards, leather spine labels, xlii, 361, (1); 332; 394pp. Minor rubbing o/w a fine copy. Stefano Arteaga [1747-1799] was a young Spanish Jesuit at the time the Jesuits were repressed in Spain. He withdrew to Italy and lived mainly in Bologna. Arteaga wrote the above, the first critical history of opera. The first edition was a single volume and appeared in Bologna several years earlier but difficulties prevented it from being printed in its entirity. Arteaga made several alterations and additions and the much enlarged second edition appeared in 1785. The work was quite successful and translated into German and French. The Legendary History of the Series of Sixty-Four Woodcuts From A Dutch book published by Veldener, 1483 with an Introduction, Written and Illustrated by.......Preface by S. Baring Gould. London: T. Fisher Unwin,	1887. 8vo., orig. pictorial vellum boards with clasps, clxxvi pp. Lacking the front free e/paper, inner front hinge cracked but o/w a very good copy. Scene Painting and Bulletin Art. Chicago: Frederick H. Drake & Co.,	(1916). First edition. 4to., orig. grey/tan cloth with a pictorial panel in blue, white,black and red on the upper cover, 254, (2)pp.ads. Very minor rubbing to the spine ends o/w a fine copy. London: George Newnes, 1902. First edition. Sm.4to., orig. blue cloth with gilt decoration on the upper cover and the spine, A.E.G., (xvi), 186pp. (BARHAM, Richard H. and George Cruikshank). 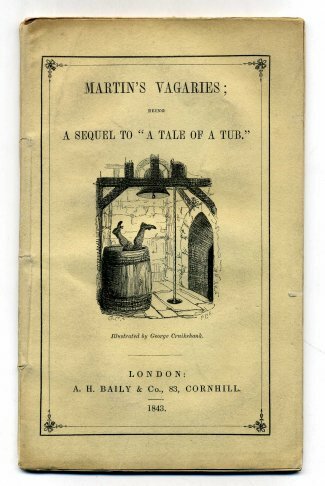 Martin's Vagaries; Being A Sequel To "A Tale Of A Tub," Recently Discovered At The University of Oxford. Edited With Notes by Scriblerus Oxoniensis, and Illustrated by George Cruikshank. London: A.H. Baily & Co., 1843. 8vo., orig. printed wrappers, 48pp. Some foxing to plates, touch of wear to the spine ends but certainly near fine. Drawing From Nature. A Series of Progressive Instructions in Sketching To Which are Appended Lectures on Art Delivered at Rugby Schoo. London: George Routledge & Sons, 1877. A new edition (so stated). 4to., orig. green cloth with elaborate decoration in gilt and black on the upper cover and spine, A.E.G., (viii), 348pp. This copy has been professionally rebacked with the original spine laid down, with the original e/papers, a near fine attractive copy. 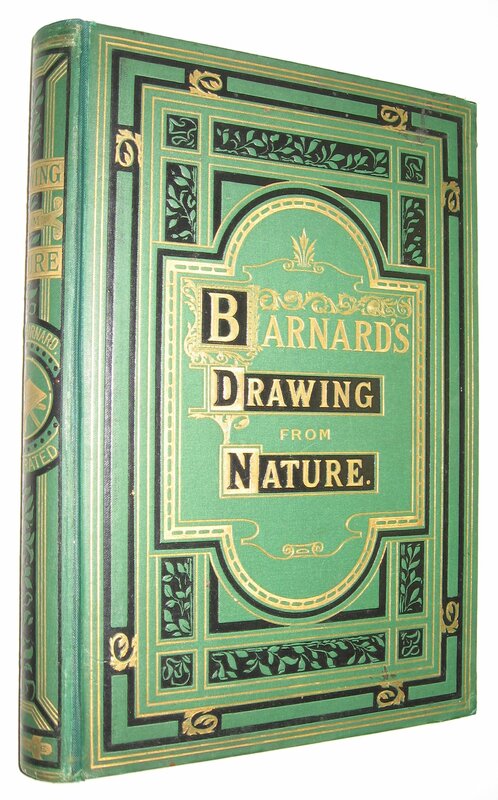 This was first published in 1865 but the binding on the first edition was quite plain, with a small gilt decoration on the upper cover. The colour printing in this new edition was done by Leighton. BATTERBERRY, Michael (text) and Ariane Ruskin. 4to., pictorial cloth, no pagination. Near fine. London: Sampson Low, Marston, Searle & Rivington,	1886. First edition. Tall 8vo., orig. green cloth with pictorial decoration in black, bevelled edges, A.E.G., xvi, 216pp. A fine, bright copy. The Flute and Flute Playing. In Acoustical, Technical, and Artistic Aspects. Trans. by Dayton C. Miller. Cleveland: Dayton C. Miller,	1922. Second English edition. Tall 8vo., orig. blue cloth, 189pp. Fine. London: Victor Gollancz Ltd.,	1928. First English edition. (copyright, Berlin, 1928). 4to., cloth, 35pp.text, 120 plates in colour. Spine a bit faded, a couple of marks on the rear board, but certainly a better than very good copy. London: John Murray,	1851. First edition. Sm.4to., full cont. calf, raised bands, gilt compartments, leather spine labels, gilt border on covers, inner dentelles gilt, T.E.G., by Root & Son, xxiv, 246, (2)pp.ads. Spine slightly darkened, some minor rubbing o/w a near fine copy.